Spirit, Opportunity, and Curiosity have rolled their way into a special place in our hearts, as the first of our rovers to kick-off our exploration of other planets. But this six-limbed, flying rover with the ability to break apart into two separate robots definitely has us intrigued. 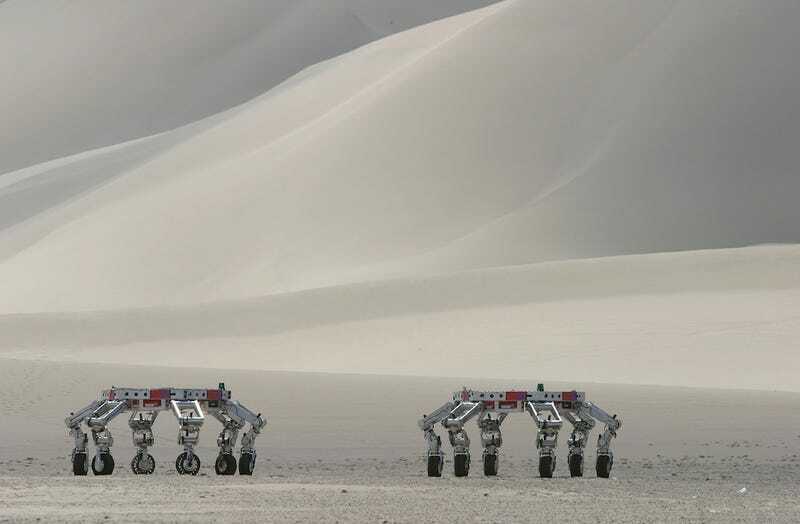 Six limbs with wheels on the ends so that it walk AND drive, and each limb can pick up tools like shovels, drills, and grippers. ...And it breaks into two independent three-legged robots. ...And we fly it around in a warehouse suspended from cables. Regarding "rovers of the future": I like to think of our robots as our "avatars" of exploration. We can't change the fact that we breathe air and walk around on two legs, but we can build robots that are perfectly attuned to the environments that we are exploring. Rovers make a lot of sense for Mars, but if we're going to explore the oceans of Europa we'll build something more like a submarine. When we go back to Titan someday we might build an airship. I think we're going to see an amazing variety in the robots we use for exploration in the future. You can read Norris' full Q&A, where he also covers what virtual space exploration might look like and just how far away a holodeck might be, right here.